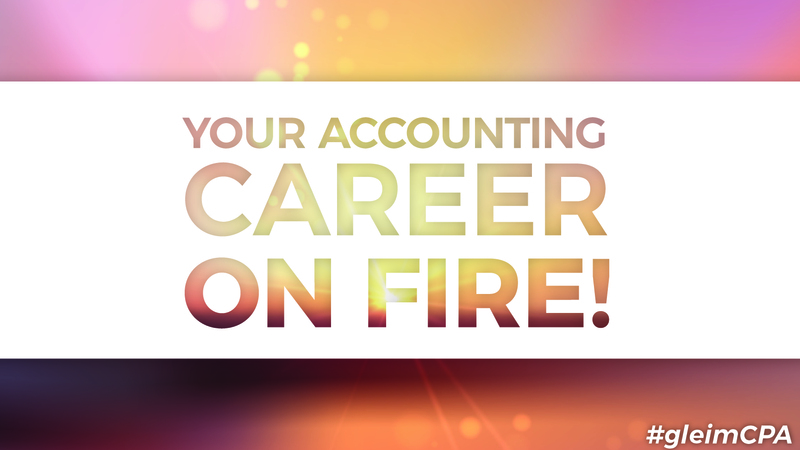 Your Accounting Career on Fire! Are you a college student interested in a career in accounting? Over the next five minutes, you will learn exactly what you need to be doing to prepare for your career in accounting — and how you can get ahead of the competition. What Are Your Accounting Career Options? A career in accounting has many different paths and possibilities. Let’s explore each opportunity so that you can find a career that is both fulfilling and fits your lifestyle goals. Bottom Line: Public accounting is the fastest way to advance your accounting career (and your salary), but it will also be the most demanding of you and your time. Another popular path to consider is a career in governmental accounting or working for a not-for-profit. These job titles will be very similar to positions you would find in private industry. Bottom Line: Going right from college to governmental accounting is a great option for accounting students. The drawbacks are that career advancement and salary increases will take longer than starting in public accounting. On the plus side, your hours will be lower, your job security will be better, and your pay will be somewhat competitive with private industry. Now that you understand the various paths you can take and places you can work, let’s discuss how to find employment in your dream accounting job right out of college! To start your career in accounting, it really boils down to who you know, how you maximize the resources in front of you and, of course, your GPA. A mistake I see many students making is spending all their time focusing on their GPAs. Don’t get me wrong, your GPA is absolutely an important part of getting into your accounting career, but there are other crucial pieces that you will need to get ahead of the competition. How many local partners, hiring staff, or company HR representatives do you know? If you don’t know any, you need to reach out and find them! When I lost my first job during the 2008 financial crisis, a public accounting partner I knew in college got me a private accounting job when NO ONE ELSE was hiring. How do you meet folks who hire? Don’t worry! It’s simple and leads us to the next crucial resource. Without a doubt, Beta Alpha Psi was the key resource in my accounting network that got me face-to-face time with partners at my school. NOTE: There are dozens of student organizations related to accounting, so do your research and find the most reputable group at your school. Yes, it’s a bit time consuming, and you will have to meet some strict requirements to join. But the relationships you make in these organizations are in my opinion more valuable than your GPA in the long term. You will not only become better acquainted with your peers, but you will also get face-to-face time with accounting firms and companies who will likely hire you in the future. You need to understand that firms look at more than just your GPA — it’s about how well they can interact with you in person. They look at you as a student and try to picture how you will interact with their teams. If you are likable and easy to talk to, they may overlook a lower GPA just because they know you will be a great fit for their team. Trust me, for about 3 years, I was involved in career fairs. I once had a 4.0 GPA student come up to speak with me, and he gave me such a weird vibe that he went straight to the bottom of the list. The way you put together your resume is an essential piece to the puzzle of you getting hired at your dream company. You need to understand exactly what hiring companies look for when reviewing your resume so that you stand out in the sea of resumes that HR reps receive. No doubt, your GPA is the go-to standard in determining if you are a good fit for a company. In fact, the Big Four firms won’t even consider hiring you if you don’t hit a specific GPA mark. If your GPA isn’t the greatest, it’s imperative that you highlight your other qualifications. Next down the line is work experience. Companies will want students who have taken initiative and found internships, job shadowed, or volunteered in a specific field. If you have the right connections and experience, you might qualify for a position even if your GPA is less than ideal. Again, this all goes back to whom you know and how well you have interacted with them and sold yourself. What certifications have you completed? Have you passed 2 of 4 sections of the CPA Exam or 1 of 2 of the CMA exam? Share that on your resume! Actively pursuing certifications is a great way of showing that you are well on your way to becoming a well-rounded accountant and a valuable asset to the company. A pro tip that I encourage all accounting students to try is to go out and interview others who have been in public accounting or in private industry to learn about what their jobs are like. You may discover that a field you found fascinating turns out to be not at all what you expected. A huge part of working for any company is also the people and the culture. Interviewing a partner or manager will be a great way to gain an understanding of the management style or expectations while on the job. Don’t be afraid to get out of your comfort zone and just ask to talk. It could change the course of your career forever and save you a huge headache of having to change paths down the road. The right accounting career path will absolutely be a rewarding and satisfying experience. My advice is that you focus your time on maintaining your GPA and developing the right relationships, which will make finding a job exponentially easier. I applaud you for doing your research now while you are still in college. If you ever need any help with passing the CPA, CMA, EA, or CIA exam, Gleim Accounting is always there to help. You can also read or watch my reviews of Gleim’s Review Courses and why I am confident they will help you achieve the same success I achieved using their products—Gleim CPA Review, Gleim CMA Review, Gleim EA Review, or Gleim CIA Review. BIO: Bryan Kesler, CPA has 7 years of accounting industry experience (both public and private) and 3 years of public accounting career fair experience that includes speaking and meeting with hundreds of accounting students. You can find him on his blog cpaexamguide.com or his free CPA exam study coaching resource—ultimatecpaexamguide.com. NOTE: Bryan is an affiliate of Gleim and will receive a small compensation if you use his affiliate links. Please only click links on his reviews if you feel his review has helped you in your purchasing decision.